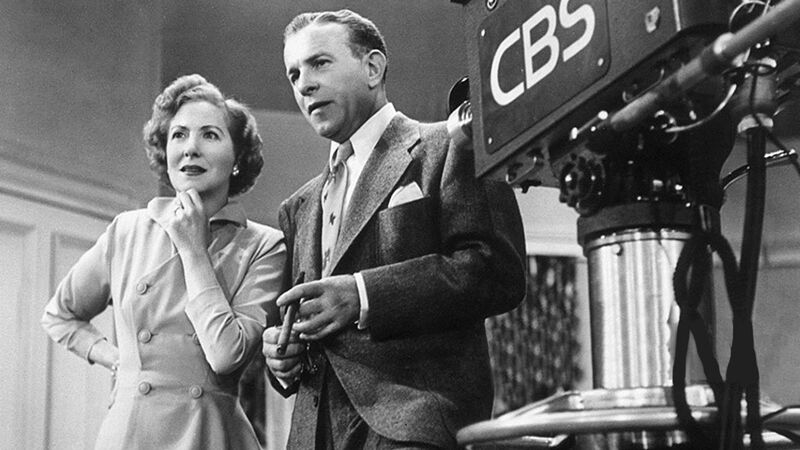 Here's where to watch every episode of The George Burns and Gracie Allen Show season 6. Mouseover or tap an episode to see where to stream it. Click or tap the play icon to stream it on the best available service. The Burnses And Mortons Go To New York Oct 3, 1955 George, Gracie, the Mortons, and Harry Von Zell are travelling by train to New York City to take up residence in the St. Moritz Hotel. Famous atomic scientist Professor Eldridge is also on the train, traveling incognito. Von Zell has an idea to pair the professor with Gracie for an ironic publicity photo. But mixups occur as he and George try to determine which passenger is actually the professor. Ronnie Arrives Oct 10, 1955 Ronnie Burns arrives in New York, determined to shun comedy for dramatic acting. Ronnie Meets Sabrina Oct 17, 1955 A beautiful young gold digger woos Harry Von Zell and then sets her sights on Ronnie, who perceives a date with this slightly "older woman" as the exact life experience that he needs to effectively portray a character in his latest play. Changing Names Oct 24, 1955 As part of his plan to become a dramatic actor, Ronnie changes his name to Cobb Cochran, so Gracie changes her name to Lola Benedict, but a misunderstood phone call leads everyone to believe George is cheating on Gracie with Lola. Harry Morton's Cocktail Party Oct 31, 1955 While visiting the book store to push George's autobiography, Blanche wallops a man whom she mistakes for a masher, not knowing he's the same guy that Harry has made business-dinner plans with. Meanwhile, Ronnie decides to get a motorcycle. The Musical Version Nov 7, 1955 George is excited as plans for his book to be made into a Broadway musical materialize. This episode contains some nice music and even has some dancing by George and Gracie. Ronnie Moves To The Village Nov 14, 1955 Ronnie wants to move in with his friend Jim and his artist father, who live in Greenwich Village. Gracie tries to keep him from moving by emulating beatnik dress and decor. Gracie Helps Lola Nov 21, 1955 Lola the waitress is having trouble getting her cab driver boyfriend to propose marriage. Ronnie's drama teacher is coming to the hotel to meet George and Gracie. These two storylines collide as Gracie does some impromptu waitressing at Rumplemeyers. Anniversary Party Nov 28, 1955 It's George's and Gracie's anniversary, and a party is planned. However, Mr. Boardman and his wife start having an argument, and in Gracie's effort to "fix" it, she winds up "unfixing" everyone else. George Becomes a Dictator Dec 5, 1955 Everyone gets involved in Ronnie's acting dilemma: he must choose between a comedic and a dramatic role. Ronnie's Engagement Dec 12, 1955 Gracie thinks Ronnie is planning to elope with a beautiful salesgirl. Company For Christmas Dec 19, 1955 Christmas is coming, and Blanche and Harry have differing ideas as to which family members they want to invite to join them in the St. Moritz Hotel. The hotel is packed, and Gracie adds to the problem by trying to help. Gracie Pawns Her Ring Dec 26, 1955 Ronnie's friend, Jim Boardman, has written a bad play and the boys petition George to finance it. Gracie decides to help them get the money. Appearances Are Deceiving Jan 2, 1956 The ""Puritanical"" father of one of Ronnie's girlfriends witnesses them rehearsing a scene from a play and gets the wrong impression. Gracie and Blanche straighten everything out, with a scheme which accidentally involves Harry Morton. Let's Dance Jan 9, 1956 Ronnie's drama school is having a dance, and Gracie wants to help out. Von Zell tells Gracie that any man in the hotel would like to go with Marie, the cigarette counter sales girl. This bit of information proves dangerous, as Gracie concocts a crazy scheme to sell tickets. George Goes Skiing Jan 16, 1956 After Mr. Boardman takes Jim and Ronnie skiing, Gracie tells George that he needs to take more of an interest in Ronnie's life, so George hits the slopes. Ronnie Gets An Agent Jan 23, 1956 Ethically-challenged agent Jack Devlin attempts to lure Ronnie into signing with him, with the hope of landing jobs for his clients on the Burns and Allen Show. Politeness Never Pays Jan 30, 1956 Gracie and Blanche want their husbands to be gallant, as they were during their courtship. Alice Gets Married Feb 6, 1956 When Alice, Harry von Zell's old girlfriend, comes to see him in New York, he believes that she plans to propose marriage. Gracie manages to complicate matters by spreading a rumor that he secretly wed Marie, the cigarette girl. George Needs Glasses Feb 13, 1956 Gracie mistakenly believes that George's vision is failing. When he is reluctant to have eyeglasses prescribed for him, she consults an eye doctor. He suggests that George might be worried about his appearence, so Gracie comes up with a ridiculous plan to make George see that wearing glasses is in style. The Indian Potentate Feb 20, 1956 An Indian Maharajah and his ""retinue"" have checked into the St. Moritz Hotel, and Gracie and Blanche cannot contain their curiosity about him and his wealth. The Ladies Club Feb 27, 1956 Harry Morton is so terrified that his career will be ruined if Gracie joins an elite women's club that Blanche makes a fool of herself. Meanwhile, Ronnie and his parents baffle everyone when they practice the Stanislavski acting method. Cyrano De Bergerac Mar 5, 1956 Ronnie is practicing the role of Cyrano, but has trouble coming to grips with a lack of self esteem resulting from comparing his own performance with a recording of the master Cyrano portrayer, Jose Ferrer. Von Zell comes up with a novel solution, which hinges on George's acting ability. The Stolen Plants Mar 12, 1956 After Gracie walks off with some plants from Central Park, Harry Morton declares she has committed a crime, so she decides to turn herself in. Meanwhile, Ronnie takes up fencing for his latest stage outing. The English Playwright Mar 19, 1956 A famous playwright happens to be staying at the St. Moritz Hotel. Ronnie would love to get a part in his current production, and Gracie tries to help in her typically illogical way. A Weekend On Long Island Mar 26, 1956 When Ronnie makes plans to hold a party for his class in the family's suite, Gracie decides to accept Blanche's invitation to Mrs. Sohmers' party at Oyster Bay. The problem is that neither Blanche nor Mrs. Sohmers invited her. The Newlyweds Apr 2, 1956 When Emily Vanderlip arrives in Manhattan after eloping with Airman Second Class Frank Foster, the newlyweds and Burns men attempt to keep Gracie from finding out about their nuptials, fearing that she'll blab to Emily's parents. Night of Vaudeville Apr 9, 1956 Ronnie's drama school is losing money and decides to put on its usual production of "Othello" to raise funds. However, Gracie talks them into doing a variety show instead, the type of vaudeville skits that she and George used to do. Burlesk Apr 16, 1956 George is in trouble for supposedly influencing Jim Boardman to get a job in a burlesque show. The Right People Apr 23, 1956 Mrs. Sohmers shows her snobbishness as she objects to a possible marriage between Ronnie and her daughter, Pat. Meanwhile, Gracie suddenly rises in social status when she befriends prominent horse breeder Alfred Tyler Griffin. The Magic Act Apr 30, 1956 Ronnie has been offered a contract for a part in a movie. Gracie mistakenly believes that the offer is for George. She decides that she must get a job to make George feel better about doing the movie without her. The Paris Creation May 7, 1956 Gracie needs a slight alteration to a designer dress she bought. George insists that she take it to the designer to have it fixed, not realizing that the designer is in Paris. Back From Paris May 14, 1956 Behind George's back, Gracie concocts plans to bring twenty four of designer Broussard's dresses from Paris to sell in New York. The Twenty-Four Dresses May 21, 1956 Gracie needs financing for the dress shop she intends to open. George wants the dresses sent back to Paris. Gracie counts on Mrs. Sohmers for help. Ronnie Is Lovesick May 28, 1956 Gracie thinks that Ronnie is planning to join the French Foreign Legion because his French girlfriend left him. The Night Out Jun 4, 1956 George gets locked in a steam room overnight. Harry Von Zell has borrowed George's overcoat to wear on a date with a young woman and leaves it at the Stork Club. These two circumstances result in a big misunderstanding between George and Gracie. Questions And Answers Jun 11, 1956 In order to become a member of the Ladies of Oyster Bay, Gracie must be quizzed on her knowledge of literature by a committee of members. Mrs. Sohmers comes up with a surprising plan to help her, but complications arise. The Triple Surprise Party Jun 18, 1956 To prevent Gracie from ruining Harry Morton's birthday party, George tells her he's throwing a party for Ronnie. To ensure he shows up, Gracie tells Ronnie the party's for George. Meanwhile, Harry Von Zell presumes he's the guest of honor. Mrs. Sohmers Needs a Psychiatrist Sep 17, 1956 Dabbs Greer plays a psychologist who is helping Mrs. Sohmers cope with anxiety created by her association with Gracie. Then he meets Gracie and is thrown for a loop. This episode features identity mixups of Blanche with Gracie, and George with Von Zell. The Switchboard Operators Sep 24, 1956 In an effort to keep Harry Morton from accepting a new position which would involve extensive travel, Gracie and Blanche take over the hotel switchboard.